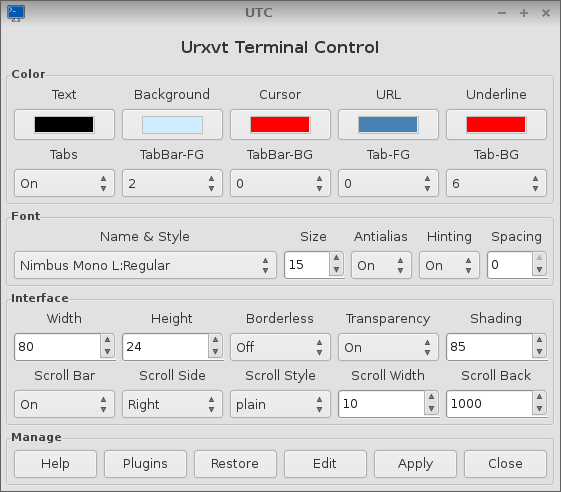 UrxvtControl provides graphical access to common configuration options of the rxvt-unicode (urxvt) terminal emulator. The user interface automatically adjusts to the available options supported by the installed version of urxvt. For example, the default urxvt 9.05 of most Puppies released since 2008 does not (as compiled) provide native support for Perl plugins. However, urxvt 9.20 of tahrpup-6.x supports useful plugins (extensions) such as tabs, clickable URLs and auto-copy of selected text to the X-Clipboard. •Borderless (on/off) Note: This option is window-manager dependent. For example, supported by openbox, but not by JWM). •Scroll Width (Default:10 Range:7-20) Note: This option applies only to rxvt, plain and xterm scroll styles. •Scrollback buffer (Default:1000 Range:0-65535) Note: Large scrollback buffers require more system memory. For your convenience, the 'Tabs' option may be enabled or disabled without changing the status of other Perl extensions, or you can select the tray 'Plugin' button to completely enable/disable Perl extensions. 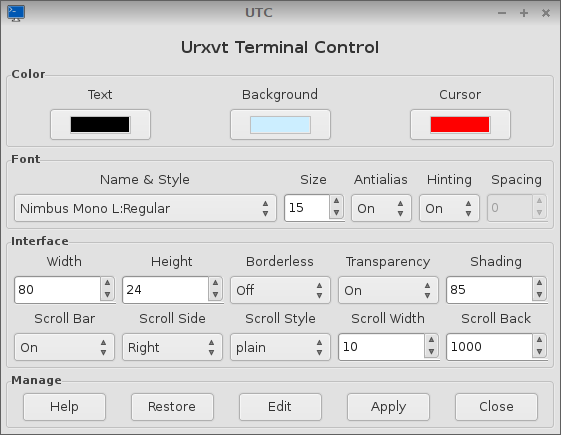 The 'Restore' button will reload the original urxvt configuration settings that were in place before the first-run of UrxvtControl. If required, the 'Edit' button will provide quick access to /root/.Xdefaults for viewing or manual editing of the urxvt configuration settings. For a tooltip status report, please hover the mouse pointer over the interface header text (Urxvt Terminal Control). The tabbed plugin interferes with the capacity of the resize-font plugin to correctly resize the terminal window when the font size changes on-the-fly. Consequently, this may require manual resizing of the window to view all text. However, if the tabbed plugin is disabled (Tabs=off in UrxvtControl), the resize-font plugin maintains the correct aspect ratio of the terminal window. When the resize-font plugin is enabled, text displayed in the terminal may truncate when a maximized urxvt window is restored to the original size. Also, decreasing text to a very small size (1-2 px) may result in complete loss of visible text. Please see caveats in the first post concerning urxvt plugins (resize-font and tabbed). 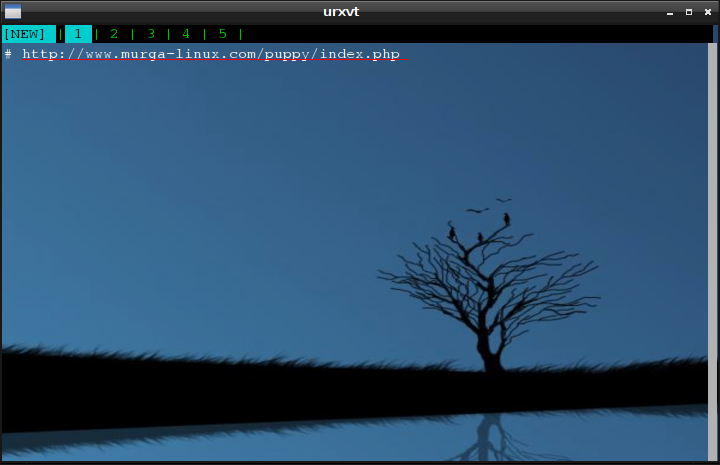 Files required for urxvt perl extensions are not included in the initial base release of tahrpup 6.0, but are in the devx. This pet contains the perl files required by tahrpup for urxvt plugins such as tabs, clickable URLs and automatic copy of selected text to the X-clipboard. Although the default urxvt terminal of Quirky April/April64 is current (v9.20), it does not support background transparency (or perl plugins). Consequently, setting the transparency option to 'On' in UrxvtControl has no effect on the urxvt terminal of Quirky April/April64. I tried UrxvtControl in Slacko 5.9.3. After installing it, I found I could not copy & paste into a console the way I'm used to (highlight to copy, then simultaneous left & right click to paste.) I couldn't find a way to paste, so I uninstalled it. UrxvtControl changes only the urxvt section of /root/.Xdefaults. No other system files are modified. In Puppy, setting the mouse to paste text into the terminal by "simultaneous right/left clicking" is controlled by the InputDevice section of /etc/X11/xorg.conf. Or, you can go to the Puppy Input Wizard -> Type of mouse -> select "Middle button emulated on 2-button mouse" and then restart X. The font list of UrxvtControl is generated by the fc-list command (run this in a terminal see the font list). The "font name:style" format in the generated list is the same basic format used in UrxvtControl and in the urxvt configuration section of /root/.Xdefaults. Thanks for your comments Flash. I hope you will give UrxvtControl another try. PS - you can also paste into the terminal by using the middle (wheel) button of the mouse, or by the Shift+Insert keyboard sequence. Additionally, in urxvt 9.20 (if compiled with perl support), you can enjoy auto-copy of selected text to the X-clipboard, for pasting to other programs. This feature is available in the updated tahrpup 6.0. Middle-button to paste into terminal? I use a Kensington Orbit trackball that doesn't have a middle button, only a scroll ring which does nothing but turn, and the left and right clickers. Puppy Input Wizard -> Type of mouse -> select "Middle button emulated on 2-button mouse" and then restart X. All seems to be ok. I could never figure out what that would do. Will it make the simultaneous clicking of both left and right mouse buttons act as a middle button? Because that's what urxvt already does -- except after I install UrxvtControl. I could never figure out what that would do. Will it make the simultaneous clicking of both left and right mouse buttons act as a middle button? Yes, in Linux, the X server can emulate the middle mouse button by simultaneous pressing of left and right mouse buttons. In Puppy, this configuration option is set in /etc/X11/xorg.conf as described above. The simple way to implement this feature, for the conventional mouse, is to go to the Puppy Input Wizard -> select "Type of mouse" -> select "Middle button emulated on 2-button mouse" and then restart X. 1 - On first boot, simultaneous pressing of the left and right buttons of my wireless Logitech mouse did not paste text into the terminal. 2 - After I changed the mouse setting in /etc/X11/xorg.conf through the Puppy Input Wizard as described above, simultaneous pressing of left and right mouse buttons will paste text correctly into the terminal, with or without UrxvtControl installed. 3 - Possibly your Kensington Orbit trackball does not interact as expected with the X-server settings in /etc/X11/xorg.conf. 4 - UrxvtControl makes no changes to /etc/X11/xorg.conf, and has no direct impact on mouse button functions that are controlled by the X server.